The situation in Tibet has turned grim with four more Tibetans, including a nun committed self-immolation in the last two days, taking the toll in the restive Himalayan region to 23 this month, increasing pressure on China's new leadership to resolve the vexed Tibet issue. At least 20 students were hospitalised on Monday after a protest turned violent in Qinghai province's Hainan prefecture, Voice of America's Tibetan Service reported. While three men set themselves ablaze on Monday, a nun died of self immolation a day earlier. Separately, Chinese security forces cracked down on a demonstration by thousands of Tibetan students in Qinghai, on Monday leaving some severely injured. The protesters shouted slogans demanding equal language rights and greater freedoms, it said. At least 85 Tibetans have set themselves in the recent months demanding freedom and the return of the Dalai Lama from exile. 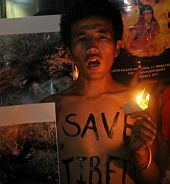 So far this month alone, 23 Tibetans are reported to have burned themselves, it said. The self immolations protests escalated as the ruling Chinese Communist Party undertook a once-in-a-decade leadership change this month. President Hu Jintao, who followed a stern policy towards Tibet focusing on development of the Himalayan region by pouring in large amount of money without any political initiatives, stepped down as the General Secretary of the Party. Vice President, Xi Jinping took over as the head of the party and the military. He is expected to formally take over as President in March when Hu stepped down and retire. While Chinese officials, who blame the suicides on Dalai Lama group played down the impact of the self immolations on the security situation in Tibet and a number of Tibetan prefectures. But the ghastly scenes of self immolations now spread to all parts of the Himalayan plateau created a restive and uneasy situation for Beijing. Analysts say no significant changes in policies were expected until March when the new administration under Xi's leadership formally takes over power formally. China has accused the Dalai Lama of being a separatist to spilt Tibet from the country. Beijing alleges that the India based Tibetan leader is instigating the protests in the Himalayan region to discredit China's image.